This is a quick guide on quickly getting Google to crawl your website. You will need to login using your Google account. There are some alternative methods you can try. You will then be prompted to enter in the URL you want Google to crawl. If you want the whole site, don’t enter anything. But if it is a blog article for example, enter in the URL path for that specific blog. This is the text that appears after your main URL. Click ‘Fetch & Render’ and after a few seconds the URL will appear in the list below. 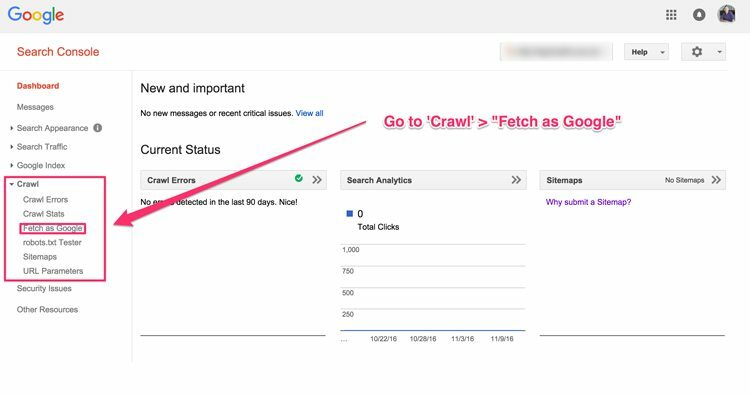 The next step will ask you if you want to just ‘Crawl this URL’ or ‘Crawl this URL and its direct links’ – I usually ask Google to crawl the URL and direct links. You are now done – you have asked Google to go visit your website – this is a great habit to get into for new blog articles and fresh content on your site. The quicker you do it, the quicker Google will index the new or updated pages.